The 2019 NCAA tournament all comes down to this. Texas Tech takes on Virginia in the national championship on Monday. Here's what to expect when each team has the ball, followed by a final prediction. Both of these teams are outstanding defensively. Texas Tech ranks first on that end, per KenPom, and Virginia ranks fifth. But it's reasonable to say these are the two best defenses in the country based on the Hoos' track record. That said, their schemes are wildly different. The Pack Line is conservative by nature; Texas Tech is more aggressive. The Red Raiders switch regularly and will trap when opponents when they least expect it. They gamble in passing lanes and expect the next man up to help and rotate. Spoiler alert: they are usually right. The most telling stat between these two defenses: Texas Tech ranks 11th in forced turnover rate; Virginia ranks 235th. That's not a knock on the Cavaliers, but it illustrates the difference in philosophy. The Red Raiders bait opponents into playing mismatch basketball. They don't really leave you another choice. That contradicts modern offensive strategy, where the goal is usually to drive to the rim and kick out for 3s. Texas Tech wants teams to isolate, and trusts that the math will work in their favor. It is outstanding at eliminating open triples. "We have interchangeable parts," Chris Beard said Sunday. "We don't have guys who are ones, twos, threes, fours, fives defensively. We have players. That's what I learned from Coach Knight. He never understood what a one, two, three was. I really don't either. "I think defensively we have a lot of players. We're not in much position. This allows us to switch and guard different people and stuff like that. That would be one part of our defense that I think is pretty good, and we try to recruit to it." This is why De'Andre Hunter is so huge in this matchup. Texas Tech has the horses to hang with him — it's the best defense in the country, after all. But switch a point guard or a center onto Hunter, and you're asking for trouble. 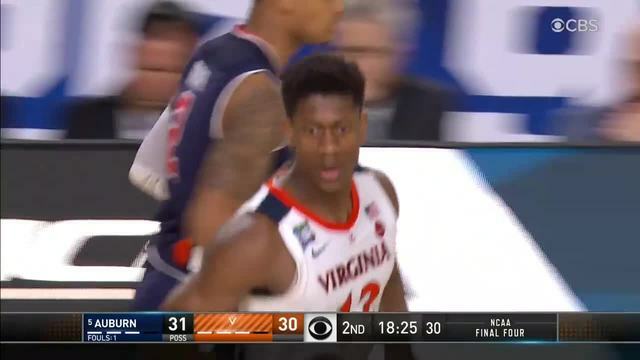 Virginia would be wise to use Hunter as the screener in pick-and-roll actions, and have Hunter stake out either the point guard or center's guy. The 6-7, 225-pounder would have a clear advantage over a Davide Moretti, for instance, even though Moretti is a solid defender for his size. Think about the lengths the Cleveland Cavaliers would go try to get Stephen Curry switched onto LeBron James in the last few NBA Finals. It's the same idea. Texas Tech would send help, of course, but this feels like the key to unlocking anything good on offense. Even Gonzaga, the No. 1 offense in the country, couldn't puncture this group. Ty Jerome and Kyle Guy are outstanding players, but unless one of them is raining 3s from Steph Curry range, this is a tough matchup for them. Cassius Winston looked ordinary against the Red Raiders. The good news for UVA: Michigan State didn't have an iso guy as talented as Hunter. Virginia needs to play through him, and hope Hunter can either scramble the defense and kick to playmakers or score himself. Easier said than done, but most teams don't have an isolation scorer as good as Hunter. Life's no easier for the Red Raiders on the other side, of course. We know all about Virginia's defensive dominance over the past half decade. We'll start with the obvious point: Jarrett Culver needs to play better than he did against Michigan State, when he finished 3-of-12 for 10 points. He probably will. Culver will have a height advantage over anyone who guards him, unless Tony Bennett decides to really mess with the positional assignments and throw someone like Jerome on Tariq Owens. Probably not happening. Culver should see either Guy, Jerome or Kihei Clark. He can, and should, shoot over any of those guys whenever he gets the chance. A possible strategy: Moretti, Culver and Matt Mooney should just let it freakin' fly on Monday night. And yes, that may result in some "bad" shots. But it feels like a more fruitful plan than trying to break down an unbreakable defense for 30 seconds and forcing a desperate heave as the shot-clock expires. Those three are all good shooters, and Virginia isn't going to chase you out to NBA 3-point range. Have a decent 3-point looks eight seconds into the shot clock? Take it. You're not going to dissect Virginia; Texas Tech's guards are good, but they don't have a speed advantage. That's the other mild weakness in the Cavs' D, but probably not one the Red Raiders have the personnel to exploit. And even if you beat Virginia off the dribble, Mamadi Diakite is a different guy this year who's eager to pounce at anything near the hoop. "Rim protection is so important," Tony Bennett said. "Sometimes your defense just breaks down. So the ability for guys to either erase mistakes, and Mamadi's been significant in that, and I know Texas Tech is significant in that capacity too, but that is -- when you can play good defense but you have some length or shot blocking behind it, it just adds another element to being harder to score against." Texas Tech is shooting 36.6 percent from 3-point range as a team and has had one of the top offenses in the country since the start of February. The "launch more quick 3s than normal" strategy could make them look foolish if it ends in clank after clank. It takes some guts. But it seems like Texas Tech's best chance at doing any serious damage against this stalwart of a unit. This is such an even matchup... but give us Texas Tech in the slight upset. It's weird to say that a team who's in the national title game isn't playing its best, but if you've watched Virginia all season, you'd know it's true. Credit the Cavaliers for getting to this point; they've earned it. But UVA looked like a more dominant force during ACC play than it does now. You can't say the same about Texas Tech, which has beaten Michigan State, Michigan and Gonzaga in this tournament. And none of those games were nail biters. Virginia's defense is great; Texas Tech's is otherworldly right now. Don't expect a lot of points in this one.